Leather Care | Redux & Co.
Our Redux & Co. leather watch straps are made from high quality American made leather from world renown tanneries such as the Horween Leather Co. in Chicago and Wickett & Craig in Pennsylvania. However, frequent exposure to dirt, sweat, moisture, water, heat and skin care products may accelerate the aging of your watch strap. Leather straps require regular maintenance so it will look good for many years. More importantly, regular maintenance ensures its quality and longevity. The joy and often unpredictable thing about leather is that it varies greatly depending on which part of the hide, and the grain. Since the leather comes from an animal, hides vary from hide to hide as well. Leather is a natural material that tanneries stabilize with tanning, but the leather will still eventually wear down. Leather has some stretch. The more it stretches, the more narrow it will become. Leather hides stretch over time with regular use and as it absorbs the oils and sweat from your wrist, even if not exposed to water. 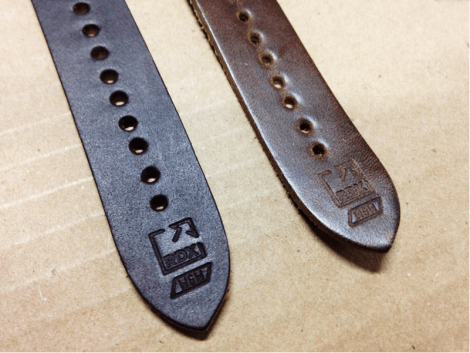 Leather strap life expectation varies greatly. Daily wear on straps ranges from a few months months to a few years. This is part of the reason why we’re switching most of our straps away from Horween and to Wickett & Craig, which is known for more consistently rugged leather hides that are usually made into heavy duty items such as holsters and horse saddles. The new lined straps we just finished development with will be much less stretchy. Let your leather watch breathe. Since you don’t have to use it while sleeping, remove it when you go to bed to prevent premature wear and tear. Keep the leather dry. Remove it before taking a shower or bathing as leather and water don’t mix. Clean the strap regularly, wipe off sweat and other moisture as soon as possible using a soft cloth and then air-dry it. Avoid wearing your watch too tight. This will stretch and age the strap. It’s not a tourniquet! Protect the leather strap from excessive sunlight and other heat sources, and swap your COURG to the ballistic nylon strap for heavy work or extreme sports. Avoid direct contact with oils, cleaning products, cosmetics, hairsprays, detergents and perfumes. Put on and remove your watch gently. Leather stretches but pulling will stretch it out unnecessarily. Take care not to bend back the strap. You can increase the lifespan of leather straps and maintain their appearance and supple feel. Our leather is selected for optimal character and to last. Take care of your strap, and it’ll take care of you.